Join the discussion on our forums! 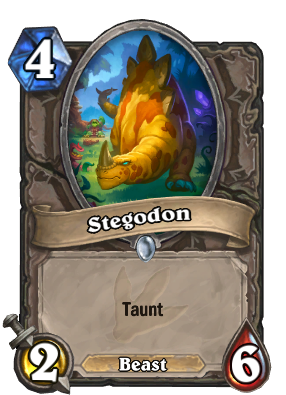 Come discuss Stegodon over in our dedicated Stegodon discussion topic. Level 40 Tortollan Paladins quest to tame a Stegodon. There are no level 41 Tortollan Paladins. Tortollan confirmed next wow race? in a world with 4 mana 3/6s this is literally unplayable no joke. I admit I find it unlikely but I suppose it is possible that this finds a place? I mean some solid beasts are needed for beast Druid but I doubt this is it. Hunter could use it if it wanted to try a control deck (something I pray actually works one day). It is technically the same stats as Sen'jin Shieldmasta which is still a decent card, even if not quite good enough right now. On top of that this has a beast tag I guess? I would like to say I am trying to defend what seems a bit lack lustier, I don't think this is quite good enough sadly. I don't think this will get played, it really could have had one more attack for the same mana, after all other cards have premium stats for the right cost with taunt added on for no extra mana. Yes, this card is collectable. It has a rarity, and its different than Spikeridged Steed's rarity. Is this collectible or only spawned by Spikeridged Steed? same amount of stats as a sen'jin but with 1 more health and 1 less attack. It deals with earlier aggro cards better, but the 3 attack is pretty important. honestly it's most likely going to see play just with the paladin spell Spikeridged Steed if that gets played at all.